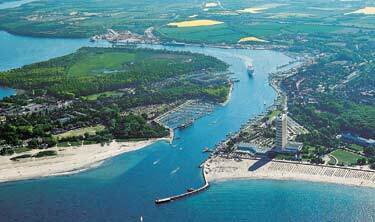 ABOVE: An aerial view of Travemünde, with a ship coming up the channel from the ferry port. Public beaches (which include an FKK nudist beach and a Hundestrand or dog beach) are to the right of the breakwater. "Travemünde's upswing began in the early 19th c. At that time, robust fresh-air fanatics propagated the new health trend of sea bathing. Some enterprising gentlemen founded public baths, and Travemünde was declared a seaside resort in 1802, after Heiligendamm and Norderney. Joachim purchased the institute in 1814, built a lodge house on it and installed bathtubs--with warm water, for sensitive souls....Travemünde became fashionable throughout Europe.Wilhelm II came here, Gogol and Richard Wagner, Dostoyevsky and Wilhelm Raabe took curesat the resort. And Thomas Mann, of course, as well." Travemünde continued to thrive as a seaside resort until World War II. After the war, the town sought to rebuild its tourist trade with a spa, a concert hall, a new beach center, and even a skyscraper (the 1973-vintage Maritim Strandhotel, which is ugly to look at but offers great views from its top-floor café). Today, Travemünde is a lively resort with broad beaches, a health spa, golf courses, horseback riding, yachting, fishing, gambling, nightlife, and other attractions such as the Old Lighthouse, the 450-year-old St. Lorenz Church, the "Oldest House" (a fishing cottage from the late 1500s), the Passat (a four-masted sailing ship), and the annual Sand World sand-sculpture festival. Travemünde is also a port for cruise ships and ferries to Trelleborg, Malmö, Helsinki, and Riga. To learn more about getting to the resort and enjoying the sights, see the next page. Photo: Lübeck Travemünde Tourismus / Sven-Erik Arndt.